Fire Safety Awareness Courses - Following the introduction of the new Regulatory Reform (fire safety) Order 2005 all companies are obliged to ensure that employees receive adequate training in fire safety on a yearly basis. This course allows companies to keep employees aware of all the key information regarding fire safety in the workplace. Fire Warden Training - This fire training course has been designed specifically for those who have been appointed to carry out the duties of a Fire Warden or Fire Marshall. 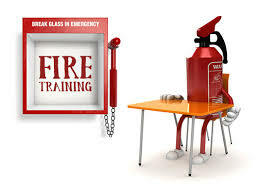 We also give free safe use of fire extinguisher training (up to 5 people) to all new customers. the introduction of new technology into the responsible person’s undertaking; or(iv)the introduction of a new system of work into, or a change respecting a system of work already in use within, the responsible person’s undertaking.